What’s wrong with mixed-berry pie? More proof that AdFreak is out of step with the rest of America: We like mixed-berry pie. What better to go with a latte at your favorite cafe on Mulberry Street? But mixed-berry is the least-loved pie among American adults, it seems, with only 2 percent claiming to favor it, according to Russell Research, which conducted a pie survey on behalf of Four Points by Sheraton. The Starwood Hotels & Resorts brand was relaunched earlier this year to target the no-fuss, no-muss male business traveler, but it has one indulgence—the quality of pie served at its locations. Four Points svp Hoyt Harper, a pie aficionado, commissioned the research to help support the chain’s pie-centric positioning. Among the other findings: The percentage of American women who say their husband makes the best homemade pie is the exact same percentage as the percentage of Americans who favor mixed-berry pie (2 percent). We don’t know if there’s a connection there, but we found that interesting. 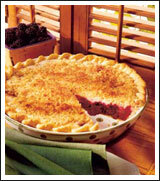 About 30 percent of men age 35-54 admitted to having eaten an entire pie in one sitting. Pumpkin pie lovers are apt to describe themselves as “funny and independent,” while pecan pie is the choice of the “thoughtful and analytical.” It’s hard to imagine anyone could remain thoughtful, analytical or even conscious with that much sugar in their systems, but what do we know? We like mixed-berry pie.